This chapter will describe the application lifecycle of the oZone framework, from init->run->termination. 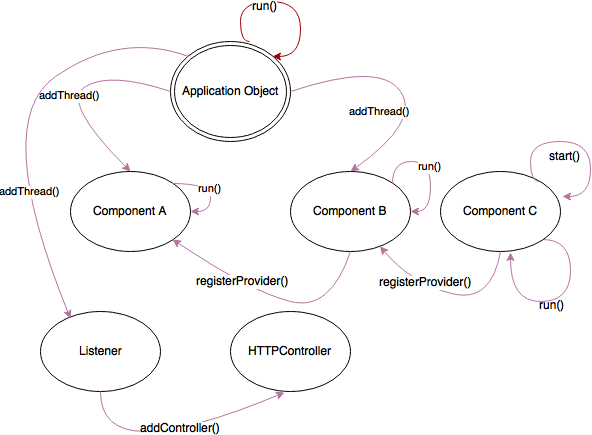 The Application object can be thought of as the master object that keeps track of all the components. When components are instantiated, they register with the Application object by invoking its addThread() method. This essentially adds the object to the Application queue. When you invoke the Application run() method, it iterates through the list of components and invokes the start() methof of each object, which essentially launches a thread for each component. Following this, it invokes the run() method of each component, which is what is expected to be the entry point of each component’s functionality. Note that the Application object is just a convenience. You can easily invoke the start() method of each component yourelf. The latter approach is typically useful when you dynamically create new components and remove them after you start the application. The Listerner and HTTPController components are used when you need to convert the frames of a component into a browser viewable version. Listerner along with HTTPController are an easy way to create MJPEG images which you can display on the browser with a simple <img src=""> tag. The Application object is really very simple. It’s implementation simply keeps a list of components. Components are added to the Application object by invoking its addThread() method which simply pushes a pointer to the component into its internal queue. Once you connect all the components to the Application object, and you invoke the run() method, all it really does is iterate through the list and invoke the run() method of each component in a new thread (yes, each component must have a run method) and then waits for them to terminate. We also talked about how components could chain to each other to create workflows. Chaining is achieved by invoking a registerProvider method of a component. line 16: launch all the threads and have fun!